Well this is quite old news, but I have been busy recently so am only getting to post about it now. 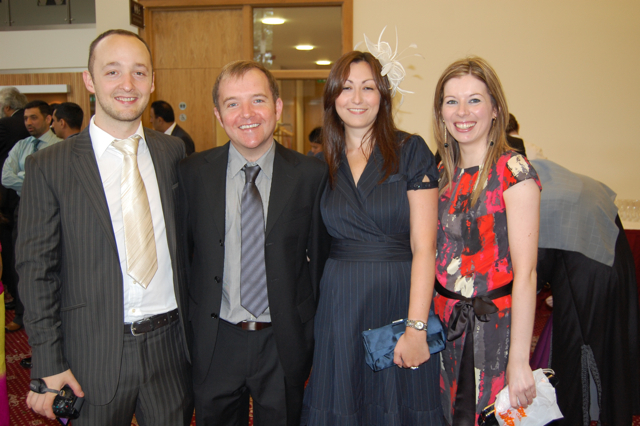 We were all at G’s Belfast wedding the weekend before last (seems like ages ago now!) It was called his barat. 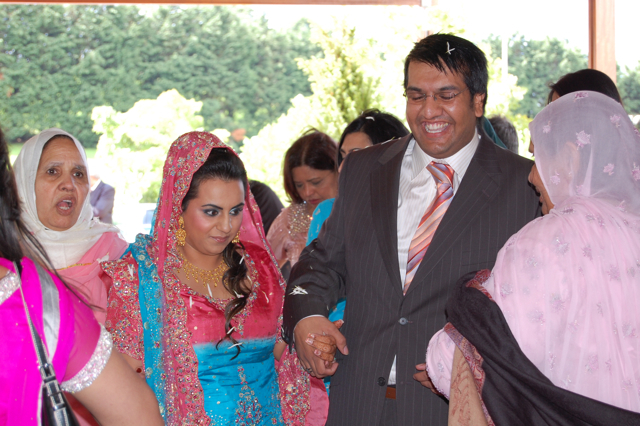 It is when Muslims celebrate the wedding in the home town of the groom, and the bride is introduced to everyone there. As you can see from the picture above, G’s new lady wife, Fiaza looked stunning when she arrived. And when she left too. The reception (that’s what it was like really) was held at the La Mon hotel outside Belfast. I’d only been up there with G to have a look before, but it was really nice. So I reckon there were about three hundred people at the wedding. The room was ABSOLUTELY massive, and was packed with people. 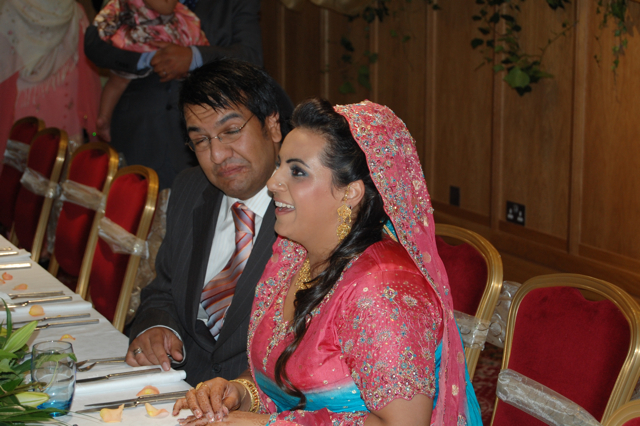 As at the wedding in Watford that Jill and I had been to, the food was amazing. 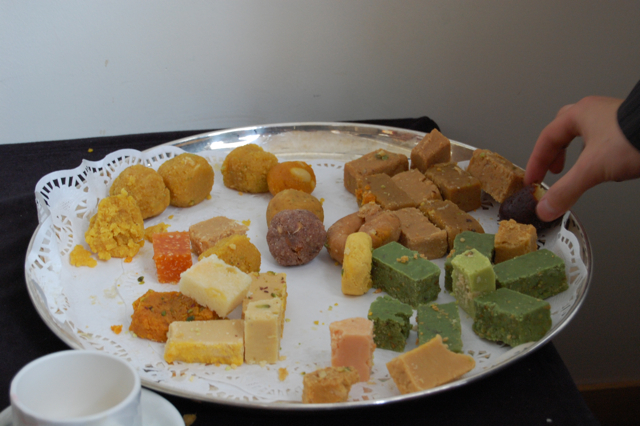 This time there were also some Indian sweeties on display – that’s them above. They were really unusual tasting. Very sweet but different from British sweeties, as they were flavours I didn’t really recognise. I can’t really remember much about them, but I think one of them had milk in it or something. So we ate plenty at G’s wedding. And didn’t drink! Well I didn’t anyway. Glo and I were very, very tired after being the last ones to leave a barbecue party at G’s mate’s Omair’s house the night before. It was a full house there with only about four people drinking. Needless to say Glo and I were two of them, and I was so smashed (although perfectly well behaved) I can’t actually remember getting home. There was a really nice attractive redhead there as well, but nothing happened there. I was consious she was completely sober so that’s what put me off making a move. So G is now a fully married man and off to Malaysia now on his honeymoon. I shall leave you with what is perhaps the best photograph of G I have ever taken!